In 2010, Korg caught the world of music technology on the hop with the pocket-sized Monotron. Superficially, it was toy-like, even smaller than a Stylophone, but inside that plastic shell was a heart of analogue, achieved using surface-mount technology and Korg's archive of classic synth designs. It was followed by the Monotribe, whose drums, sequencing and more professional appearance fanned the flames of hope for a continuing upward trend. However, it seems Korg aren't finished with the earlier format yet, as evidenced by the two Monotron models on review today. Timed to ship near to Christmas, might they be the ideal musicians' stocking fillers? 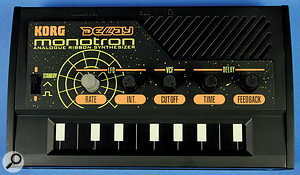 The Monotron Delay and Duo have the same dimensions (approximately 12cm x 7cm) and the same layout as the original model, but with an added splash of colour. Each brings something new to the table, but neither deviates from the brief of being cheap and cheerful. As before, they are played by a ribbon just 8cm long and have built-in speakers, a rear-mounted volume control and an auxiliary input for processing external signals via their much-praised MS10/MS20 low-pass filter. Monotrons are highly portable, thanks to two AAA batteries with a respectable life of around eight hours. It's when you connect them to your regular sound system (using the stereo headphone mini-jack) that the depth, quality and appeal of these diminutive analogues becomes obvious. The Monotron Delay's back panel features a mini-jack headphone output and auxiliary input, a volume control and a screw that adjusts the 'duty ratio' of the LFO's waveform. I turned first to the Monotron Delay, which outshines its siblings on two fronts, one of them literal: it's labelled in UV-reflective paint. Under black light, the glowing orange text, in particular, should mesmerise geeks, spelunkers and party animals the world over. Its second (and admittedly more practical) new feature is a built-in delay effect that works wonders on the single VCO synthesizer. Korg have long understood the value of onboard effects, especially to the performing musician, and the reasoning is as sound now as it was when I bought my DW8000 keyboard so many years ago. 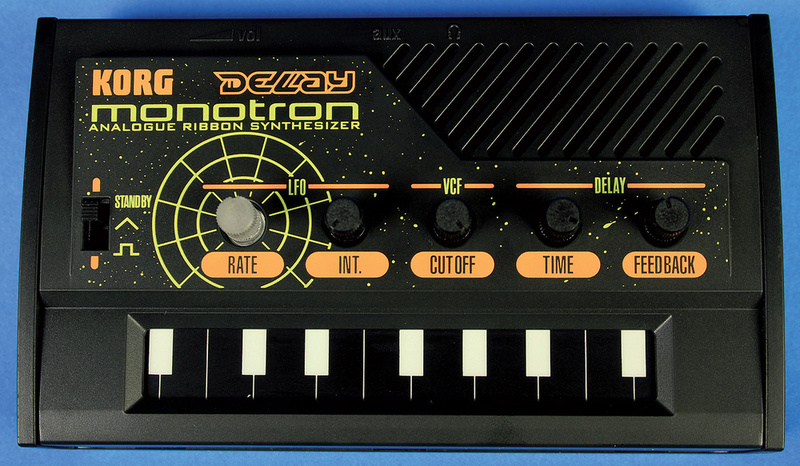 The Delay's synth is so basic its sawtooth oscillator has no accessible controls at all — other than the ribbon that smoothly sweeps its pitch over about six octaves. You should therefore consider the keyboard markings to be of decorative value only. The Delay's five knobs set the rate and intensity of the LFO, the time and feedback of the delay, and the filter cutoff. This is the same low-pass filter found in all Monotrons, the only difference being that there's no space on the panel for a resonance knob. The on/off switch also serves as an LFO waveform selector with two choices: triangle and square. That's it as far as performance control goes, but there is one final item tucked away in a recess at the rear. This is a small screw that changes the 'duty ratio' of the LFO waveform, replicating the old Korg MS trick of varying the LFO shape continuously. When triangle is selected, a twist of a screwdriver changes the shape from sawtooth through triangle to inverse sawtooth, while for the square wave, pulse width is varied. The LFO provides pitch modulation that extends into the audio range, and as its rate knob is of clear plastic, you get a visual representation of the frequency via a green LED on the circuit board below. At the rear of the Monotron Duo, we find the same headphone and auxiliary input ports as the Delay, but also a red button that is used to cycle through different scales for the ribbon controller.Pitch modulation can be eerie and warbly all by itself, but when engulfed in delay it becomes far more potent. There's no information given about the maximum delay time, but in my recordings it clocked in at just over one second. The delay is clearly digital in nature, something you spot as soon as the feedback reaches maximum and the audio degenerates into a distorted — yet not unpleasant — digital crunchiness. If you adjust delay time during playback the delay mimics analogue behaviour by also changing the pitch, just as a tape-based delay would. This is really rather wonderful from a box so innocent-looking! Turn anti-clockwise towards the shortest delay times and you're into the realm of metallic, reverberant drones tuned by fine adjustments of the time knob. Happily, you can plug another Monotrons or external source into the auxiliary input for processing by the delay and then the filter. In this respect, the owner's manual is incorrect, showing the filter before the delay in the signal chain when, in fact, it comes after. The delay output is very noisy, so the routing chosen makes far better sense anyway. As you close the low-pass filter, it smoothly removes the excess noise, along with the synth output and any repeating feedback tones. The feedback control also incorporates delay mix, so turning the knob clockwise leads to a rush of overdriven delays that, at the maximum setting, even surpass the source signal. In fact, turned anywhere after its two o'clock position, feedback rewards you with dirty, crazy stuff that degenerates rapidly into utter filth. In the few weeks I've been playing with the Delay it's been my nerdish delight to reproduce one classic sci-fi sound effect after another. For those who appreciate synthesis of a more tuneful nature, Korg offer the Monotron Duo. 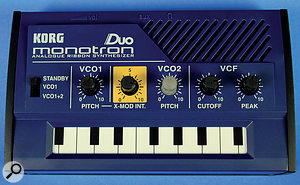 Made of blue rather than black plastic, the Duo is closer in design to the original Monotron, the main difference being that instead of an LFO it has a second VCO. This provides the basis for an alternate range of tones generated by VCO cross-modulation — or X-mod. Korg's Mono/Poly is mentioned as the source for this particular treat, but any correlation between the two seems tenuous at best. However, what really sets the Duo apart from the others is the selection of programmed keyboard scales marking it as the 'go to' Monotron for melody. Both of the Duo's oscillators are square waves with fixed pulse-widths. There's independent control over their pitch and their range is reduced slightly compared to the other Monotrons, making it more controllable for bass and solo duties. By careful adjustment of the two pitch knobs, you can summon up detunes, musical intervals such as fifths and octaves, or more abstract, unrecognisable tunings. I noticed that the oscillators soft-sync quite easily: ie. they can lock perfectly in pitch. This isn't always a desirable trait, as it eliminates some of the more subtle analogue 'swimminess'. But here, with tiny knobs to make adjustments with, it is not unwelcome, and you can always add instability by introducing a tiny amount of cross modulation. Once locked, the automatically tuned oscillators remain together even on initial power-up, giving the impression that they're actually DCOs rather than VCOs. Although VCO2 is the nominal modulation source, it is clearly affected by the pitch of VCO1 also. This can be seen thanks to an internal LED and VCO2's clear-plastic pitch knob. A switch selects whether VCO1 or both oscillators pass through the filter to the outside world. If you select just VCO1, the second oscillator isn't heard directly and serves as a modulation source only. The effects of cross-modulation are anything from a slight distortion or harshness right up into pseudo ring-modulation atonality. The X-mod intensity knob on its backdrop of custardy yellow therefore becomes a valued performance control when soloing. Soloing is something I find challenging on the original Monotron so I'm glad to see this addressed — within the limitations of the ribbon, anyway. At the rear, in the place of the Delay's LFO shape-shifting screw, there's a small red button that selects the available scales. Keep pressing it and, in round-robin style, the ribbon is quantised to chromatic, major, minor and continuous scales, with chromatic mode the default on power-up. With the ribbon's keyboard a fraction over one octave long, you won't be trotting out Grieg's piano concerto to impress your mates, but as long as you're comfortable tuning root notes by ear, this Monotron is definitely playable. Pick a scale and the ribbon becomes a controllable means of musical input, especially when played with a pen tip or a stylus. The scales have the side-effect of negating the Monotron's finger-wiggling vibrato technique. Fortunately, this is still achievable in continuous mode, where you can sweep the pitch smoothly from note to note, creating quite expressive Theremin-type solos. Common to all Monotrons, the ribbon triggers a simple on/off envelope that produces an audible click, which is especially noticeable when the filter is partially closed. This aside, two oscillators plus a rasping resonant VCF offer bigger solos and stabs than any pocket synth has a right to. The oscillators' square waves are distinctly hollow, separating the Duo tonally from both other Monotrons and, experimenting with cross-mod amounts and tuning, I discovered drones of a gritty, almost didgeridoo-like quality. The auxiliary input is once again present, so that external sources can be filtered. This is ideal for adding resonance to the Delay model, should you own both. There's something very endearing about the whole Monotron range, and it's hard to imagine the newcomers won't be snapped up in large numbers. For example, within just a few minutes of switching on the Monotron Delay, I had resolved to keep it. I'm a sucker for delay effects generally but, given that this is an inexpensive, battery-powered synth with a freaky, degrading delay built in, I don't think I'll be the only one hooked. The combination of a pitch-sweeping delay and feedback that reduces every source to a rough, noise-like mulch creates a strangely unique and beautiful lo-fi instrument. The Delay is equally useful for processing the other Monotrons, and even though it's the noisiest of the bunch, I didn't personally see this as unpleasant. There's always the low-pass filter to tame the hiss a little, but for cosmic sound effects, think of it as adding atmosphere. For more conventional performance, the Duo is intended to slot in. You might have to record in stages if your melodies stretch beyond an octave, but being able to quantise the ribbon to recognised scales is the Duo's trump card. Ironically, it might still be the one that's most overlooked, but it has its own charm, thanks to its filter and screeching cross-modulation. Of all the Monotrons, it is the one that improves most dramatically when you switch to full-sized speakers and external effects. Being analogue, these new Monotrons will probably be modified as widely as the original — an option denied to purchasers of far more expensive virtual analogues, I can't resist pointing out. In just over a year, Korg have upgraded their status from 'experimentally dipping a toe back in the analogue pool' to 'number one Japanese analogue synth manufacturer'. This has a nice ring to it and with that last thought, I'm going to dare to hope that the next surprise will be even bigger! The only Monotron alternative that comes to mind is the Gakken SX150, although I've never seen one personally. It's also inexpensive and Japanese but supplied as a self-assembly kit, so it's something to experiment with if you're into hacking and modifying gear, but of less general appeal than the Monotrons. It's a battery-powered analogue synth you can take anywhere. Freaky sound effects from its digital delay. Looks great in UV light. Can process external gear through its delay and filter. There was no room for a resonance control. An instant source of UFO noises, space crickets and phasers that also doubles as a portable processor for other Monotrons. At the price, irresistible! A Monotron you can actually play. It's another battery-powered analogue synth you can take anywhere. Cross modulation mines new seams of weirdness. External signal input for the resonant filter. It's a shame not to give it UV paint too. This Monotron's ribbon can be quantised to a selection of scales, plus it has raunchy cross-modulation and that Korg MS-style analogue filter. Monotron Delay and Duo, £42 each including VAT. Monotron Delay $49.99, Monotron Duo $49.99. Korg +1 (631) 390 8737.